Alexander Pavlista, longtime potato specialist and crop physiologist at the UNL Panhandle Research and Extension Center in Scottsbluff, has been awarded the Honorary Life Membership (HLM) by the Potato Association of America (PAA). The award for lifetime achievement and impact on the potato industry is the highest honor given by PAA. 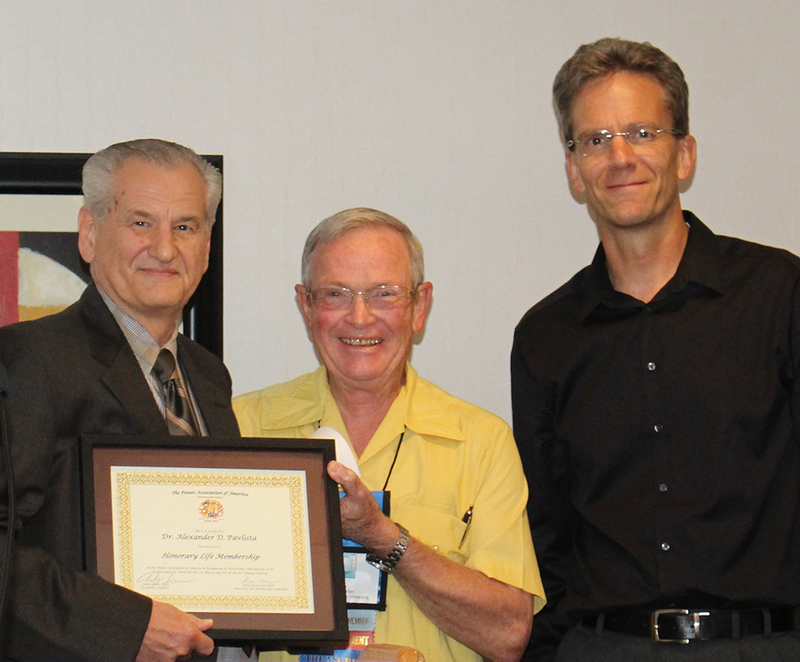 Alexander Pavlista (left) receives Honorary Life Membership to the Potato Association of America from Larry Hiller (center), nominator, Washington State University, and Andrew Jensen, PAA president, Washington State Potato Commission. Pavlista was the UNL potato specialist for 27 years, from 1988 until earlier this year, and currently is the crop physiologist at the Panhandle Center. He came to Scottsbluff from Princeton N.J., where he had been a research biologist with American Cyanamid Co.
Born in Prague, Czechoslovakia, Pavlista came to the US in 1951 and grew up in New York City. After receiving a bachelor's degree from Manhattan College, he worked for two years at Oak Ridge National Lab in Tennessee. Returning to New York, he received a Ph.D. from City University of New York in 1977. After working as a Research Associate for the U.S. Department of Agriculture for two years at North Carolina State University in Raleigh, he joined American Cyanamid Co. in 1979. At UNL, his potato work has centered on plant growth regulators and hormones, environmental response and deficit irrigation, vine desiccation, and the control of pests such as potato psyllids and early blight. He released the cultivar Red Cloud and has published five book chapters and 42 journal articles on potato, and 25 journal articles on other crops (corn, wheat, dry bean, canola, and camelina). His Extension achievements include the Potato Education Guide in CropWatch, 20 volumes of the newsletter Nebraska Potato Eyes, 22 Extension publications (NebGuides and Circulars), more than 20 years of cultivar evaluations (many published in USDA's "National Potato Germplasm Evaluation and Enhancement Reports"), and pest control reports and alerts for potato growers. In nominating Pavlista, members of the potato industry said the honor was well deserved. "I have had occasion to talk with several of the Nebraska growers that Alex's research has helped. They were all highly respectful and grateful of this New York transplant and his many efforts to help them be better growers," according to Sam Thornton of Syngenta Corp. "His newsletter was anticipated and well read by many in the potato industry and Alex always chose timely subjects that would benefit all potato producers. Alex's contributions to the potato industry through his research efforts and communications to all the potato industry have well qualified him for this great honor." "I have known Alex as a respected colleague for more than 20 years, have followed his career with interest, and have been most impressed with his extension work, including the website ‘Potato Education Guide' and his newsletter ‘Nebraska Potato Eyes'," said J. Creighton Miller Jr. of Texas A&M University. Pavlista is only the second person at UNL to receive this honor. Robert O'Keefe received the award in 1990.